To allow enough pouch area to operate the playing valves, the pouches have to be too wide to all fit in one row on the 1" centers on the pouch board. Every other pouch is located on a removable wooden block, to form two overlapping rows of wider pouches. This horizontal cross section through the pouch board shows this. The cups are attached to the board with two #4 x 1-1/4 flat head wood screws. 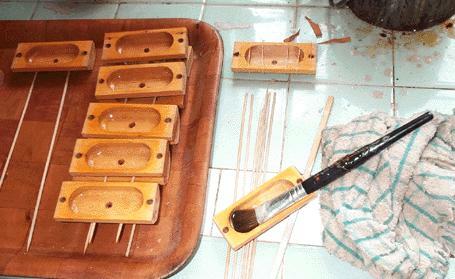 The first 13 cups, at the bass end, have wells the same width as the others, but of a slightly longer length, top to bottom. to get enough area to move the larger bass pallets. The cups are dipped in water to loosen the remnants of old leather, and cleaned off and dried. The cups are made of ordinary yellow pine. The stock from which they were made was edge jointed from narrow boards to preserve the quarter sawn orientation. Some of these joints came undone or opened partially, so a few of the cups ended up in two pieces. These were mended with permanent yellow glue. Unlike the pouch wells on the main board, these pouch wells were sealed with hot glue. A fresh coat of hot glue was applied to the insides of the wells and the end grain face of the blocks. Each block has a gasket, made from cowhide skiver; very unusual for Aeolian Company. Leather Supply House "thin packing leather" proved to be a perfect substitute. A pattern for each of the two sized gaskets was made on Visio, and pasted on the hide with Spraymount temporary adhesive. Then the gaskets were cut out and punched. The paper pattern piece easily peels off the gasket, leaving nothing on the leather. 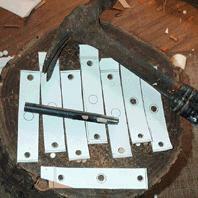 The gaskets were glued onto the blocks, and trimmed to length with scissors. Then the screw holes were whiffed out with a wire size drill, slightly larger than the original hole. Modern wood screws are theoretically the same size as the originals, but in fact their rolled threads have a slightly larger peak diameter on the threaded section, than the cut threads on the old ones. It is important that the threads do not get a grip on the clearance hole in the cup, so that the screw is perfectly free to draw the cup tightly to the board.